Yes I have been home, for a whole week…all by myself! And when I left to come back here I felt like I could easily stay for another week, month, year or forever even! 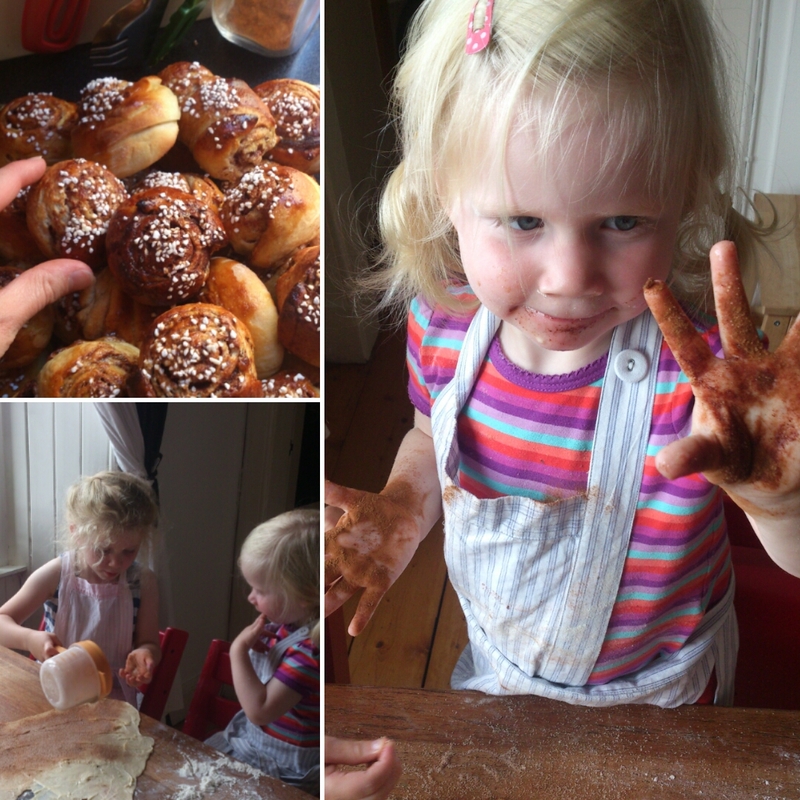 Sadly a week in Sweden was maybe not the best. I mean I loved it so much I did not wanted to come back here at all. It hit me hard how much I miss Sweden and my family and my friends. I have a great family here in Scotland and great friends as well so am a bit mixed feelings. I guess it is life! 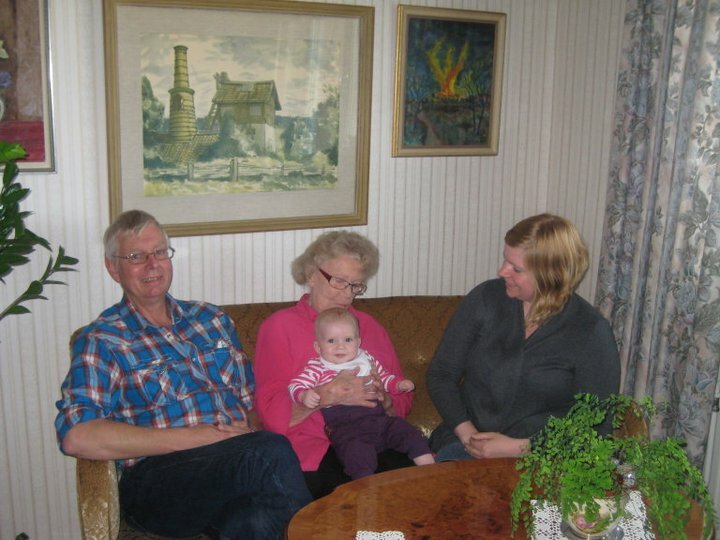 Unfortunately I did go home due to my beloved farmor (father’s mother) passing away. Even though it was excepted and I did kind of say good bye to her last summer I was hoping I would get one more summer with her. She was not well, so was almost 91 and she had decided it was time for her to go. So it was a journey home for me to join my family and say good bye and tell her we love her and hope she will finally meet up with farfar (father’s father) again. No I am not religious, I just have a little hope that they will be together again. My sister had arranged a massive flower arrangement from us grandchildren and she had written on the card, give farfar our love. That made me cry and warm to my heart. The two of them was a proper team and I do wish there is some kind of chance for them to meet up again. I decided to stay in Sweden for a week and spend time with my family and friends and to do a few business things as well. And yes I left the girls back in Scotland, but they were being so spoilt by Richard and their farmor and farfar so they did not really miss me at all! Hmmm, well I will missed them terribly and I did look forward to cuddles and snotty kisses and lots of stories when I got back. This time of year there are no direct flights between Gothenburg and Edinburgh so I did the Copenhagen detour, flights and then train. Instead of the direct train from the airport I took the Oresrund train across the bridge to Malmo and then the fast train to Gothenburg. 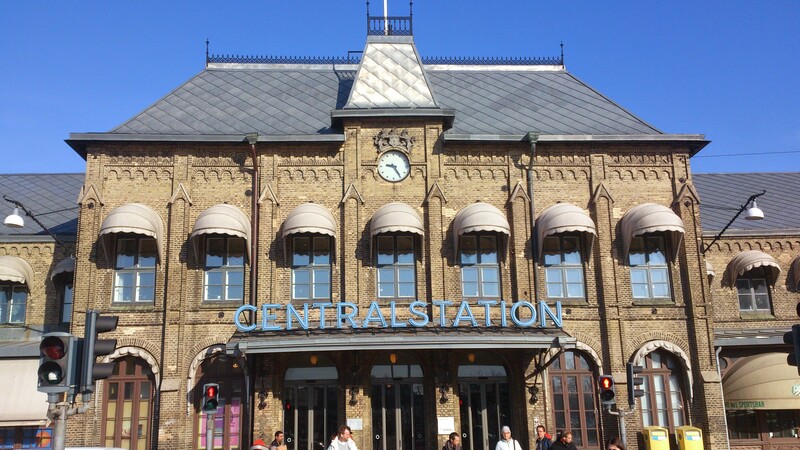 Got 20 min at Malmo Station and yes a massive bag of Swedish sweets! Felt a bit sick to be honest. 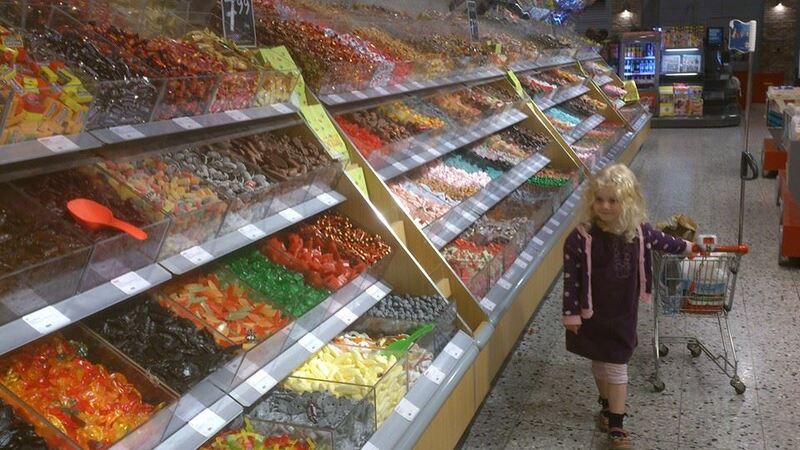 Pick n mix is massive in Sweden, this picture is from last year when we went to our local food shop and Stina started to jump just looking at all sweets. I hardly eat sweets in the UK, but happily gobble it down while home, and not just a little, but happily so much you even feel your teeth is protesting. Having the freedom of being home without any children and not a lot booked in made me a bit restless, so I took long walks and also dragged mums dog with me. I love the forest but since I am a bookworm I have read too many crime novels so obviously I expect dead bodies everywhere and I have a terrible fear of snakes so avoid going out in the forest summertime, but after a few goes, I felt relaxed enough to just stop and listen to the birds and the wind in the high trees and just peace and quiet. You sometimes forget how much peace the nature can bring, sure is good for your soul (and guess what I did not come across any dead bodies, not even a bloody finger). Also the opportunity to jump in a car and go wherever you like. Thank you mum for lending me your car. Went to my sister one evening and headed out to her summerhouse (almost every Swede has a summerhouse, I guess it is due to our long summer holidays and the urge to leave your every day routine and just go away and relax) and put up a few rolls of wallpaper. Not done it for a long time so that was good and nice chat too. I even managed to view a house, a house I walk by almost every day when I am home, mum live across the field in that red house you see on this image. Location wise it was very handy and yes I was curious. 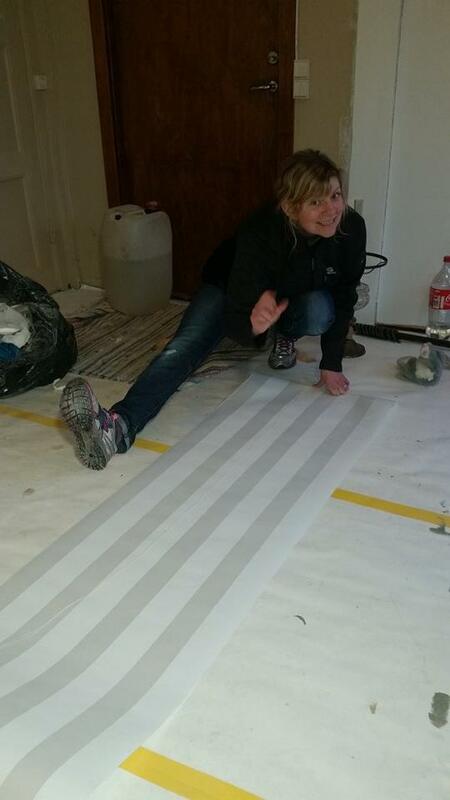 And it is even more handy to have a step dad who is a joiner to come along for the viewing. Lovely house at a good price but sadly needed new roof and a new foundation so good bye affordable house. Shame, would have been great as a little summer house for us. Not a big house but perfect for a small family, instead of us spending a few very long weeks at my mums every summer (think we all get a little bit tired of each other). Now back in the UK, I think Stina was more interested in the gifts I brought with me home than me (hmm). To sum up this journey, full of emotions, fresh air and family love. When the girls was in bed on Thursday night, Richard and I was sitting in the sofa chatting, and I feel asleep in the middle of a sentence. Now a week or so later I am starting to recover and sometimes a routine life is what you need to think clearly and logical again and feel less emotional. Am really delighted to be back at the shop. Do love our little shop and it looks so inviting at the moment. I am extremely grateful for Zuzanna and Ruth. I can go away from the shop and not feel worried at all. I can even go away for a month and they will look after it which is fantastic and relaxing. Thank you ladies, the shop looks loved!! !